Founded on July 14, 2007, the Meteorite Association of Georgia was established to bring together meteorite enthusiasts both in Georgia and beyond to pursue their common interest. Anita Westlake and Dave Gheesling met in May 2007 to discuss the formation of a group of local meteorite enthusiasts, after Dave found her name on the internet as a local meteorite enthusiast. 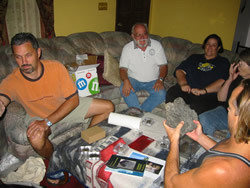 Through Anita's local relationships, the Meteorite Association of Georgia (MAG) subsequently met for the first time at Jerry Armstrong's house in July 2007 with several charter members including Jerry, Harlan Trammell, Martha Brown, Tim and Bunty Cantwell, John Iacullo, Barry Gheesling, Anita and Dave. Establishing a quarterly meeting schedule from the outset, the group met at Dave's house in October 2007, Anita's house in January 2008 and Dave's office in April 2008. As the group has already grown much faster than expected, all of these venues have been outgrown and the July 2008 meeting is tentatively slated to take place at the new Tellus Museum facility in Cartersville. 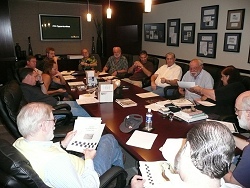 As our Mission Statement indicates, MAG members (many of which do not live in Georgia) have a variety of motivations for participation in the association. These include but are not limited to networking, educational outreach, specimen trading, group acquisitions, camaraderie and the like. One common goal throughout the group is the growth of the association through the increased awareness of meteorites and meteoritics, and several members devote a considerable amount of time, energy and other resources in speaking to local schools and other organizations to advance this cause. You can read a more detailed account of the creation of MAG in Dave Gheeslings article published on IMCA Insights and in the November 2008 issue of METEORITE! magazine. Chris Thompson, Interested in the space program since he was a child. Chris is an official NASA Ambassador, and worked at the Johnson Space Center. He volunteers at numerous schools to teach children about the space program and the universe. Chris also taught for several years at Georgia State University's Saturday School program. Jerry Armstrong, a well known meteorite collector and sought after cosmic artist, has been an amateur astronomer for decades and discovered a supernova in M51 on April 1, 1994, beating the heavily-funded Berkely search team by 40 minutes with nothing but his telescope, a timely photograph and a deep understanding of that galaxy's features. Harlan Trammell is an avid meteorite collector, Native American artifact hunter, boat captain and storm chaser. David Hardy has a 300+ location meteorite collection which features almost 40 unique pallasites. Sean Murray, our Webmaster, has a specific interest in tektites in addition to his ever-expanding meteorite collection. Anita Westlake works at the Tellus museum, has an impressive meteorite collection and is also active as a speaker in both the meteorite world and the geology arena. Dave Gheesling, a local meteorite collector, spends what little time his schedule allows teaching Meteoritics 101 to local students. And this is just the tip of the iceberg as we continue to rapidly grow. You can see all of our members on our Membership List page. MAG is open to all interested parties who share the broad vision outlined in our Mission Statement above, and the minimal annual dues are intentionally not cost prohibitive. Please fill out our application form if you are interested in joining the Meteorite Association of Georgia! Please feel free to contact us with any comments!